The SCOUT PACK includes one Original Beginner Kit, one Cape Cod Blueberry Kit, one Kids Kit and one New England-style Footstool Kit. Detailed easy-to-follow, completely illustrated instructions included. Shaker-style Original Beginner Kit has round bottom with oak handle, 1/2" flat, 3/16" reed, cane. Great first basket. 6" diam. x 8" tall. Very easy. Ages 12 and up. Cape Cod Blueberry Basket Kit has Shaker-style square bottom with carved and notched oak basket handle. Uses 1/2" flat reed, 1/4" flat, and cane. This is our most popular basket weaving kit. It has an easy to weave square bottom in plain basket weave (over under over under) style. Excellent for ages 14 and up. Kids Kit has 4" round pre-drilled base, beads & #3 round reed. Wood bases makes it extremely easy for young people to learn weaving without having to weave a base. 4" x 6" Perfect for ages 9 and up. 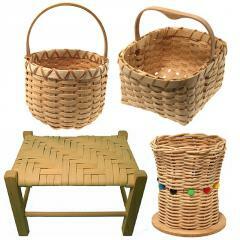 New England-style Footstool Kit includes frame and flat reed to weave the camp stool/footstool. SKILLS LEARNED: round radiating spoke base woven over odd number of spokes, square base with plain weave, weaving with round reed and drilled bases, Cut and Tuck, rim lashing, using notched handles, twill-weave over dowel frames.